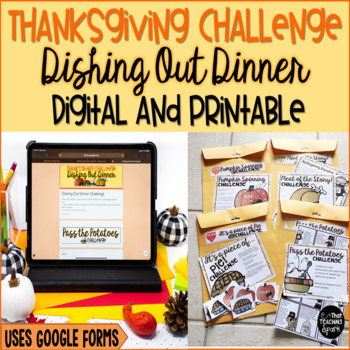 Keep the engagement up before Thanksgiving break, with this Math and ELA Challenge! Students work in teams to complete four challenges. Each challenge earns them a food item for their Thanksgiving Table! *Students spin a spinner to create a multiplication problem, solve it, and create a fact family from it. *Students answer Thanksgiving related Word Problems. *Students read a Fiction and Nonfiction story about Thanksgiving and answer comprehension questions by restating the question and writing in complete sentences. *Students sort through thanksgiving themed words and decided if they are nouns, verbs, or adjectives. Then they must write six of the words in sentences. To play, determine how many groups you will have. I usually have five groups with 4-5 students per group. Each team will need their own envelope for each Challenge. 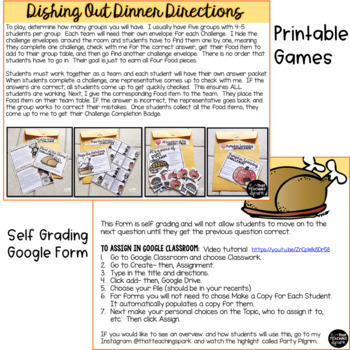 I hide the challenge envelopes around the room and students have to find them one by one, meaning they complete one challenge, check with me for the correct answer, get their food item to add to their group table, and then go find another challenge envelope. There is no order that students have to go in. Their goal is just to earn all four food pieces. Students must work together as a team and each student will have their own answer packet. When students complete a challenge, one representative comes up to check with me. If the answers are correct, all students come up to get quickly checked. This ensures ALL students are working. Next, I give the corresponding food item to the team. They place the food item on their team table. If the answer is incorrect, the representative goes back and the group works to correct their mistakes. Once students collect all the food items, they come up to me to get their Challenge Completion Badge. *I make sure to tell my students that these are traditional foods served at Thanksgiving NOW. These foods, including turkey, were not served at the First Thanksgiving. Want more fun Thanksgiving resources? Love this and want more fun centers?